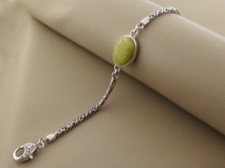 Love this clean humble look that draws all your attention to this earthy one of a kind stone. 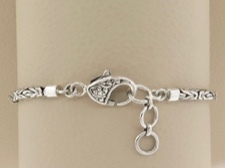 Set between sterling silver byzantine chain and closes with an ornate sterling clasp. Closure ranges from 7.25, to 7.5, to 7.75 inch. St John Opal is a lovely natural stone found here on the island of St John. 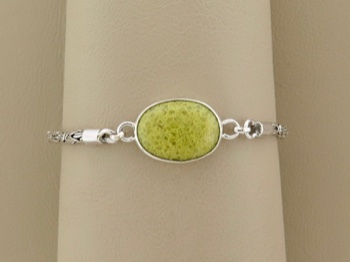 Its lovely color ranges from a pale light lime to a deep rich olive. No two stones are alike! Please see below for a size reference.